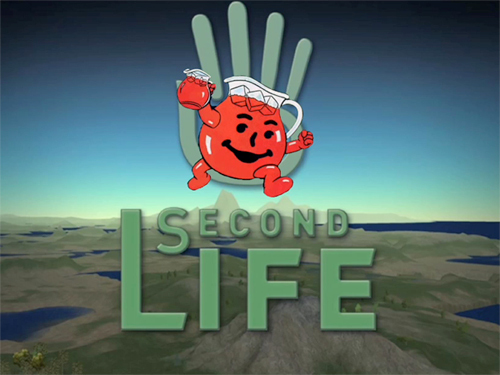 John Rafman's Kool-Aid Man is a Second Life avatar of a popular American advertising character of the 1980s and '90s. The avatar's existence was an ongoing never-to-be completed performance carried out in the virtual world of Second Life. Recently, though, Rafman killed off the character claiming, "he was taking up too much of my time. I had him commit ritual suicide in a gallery performance. Now I make movies in Second Life instead." Until his untimely end Kool-Aid Man searched this user-generated world for what Rafman called 'sublime kitsch' and later went on to offer tours of the Second Life world to interested parties - individuals, groups or educational establishments - unfamiliar with the platform. Many users of the game barred him from their excursions in their world thinking he was mocking them. "Often im considered a griefer," he explains, "a griefer is a sorta terrorist or troll in SL, whose sole goal is ruin others experience of the virtual world." Rafman says: "I see Kool-Aid Man as a self-conscious professional web surfer “breaking through walls” into various Second Life communities and subcultures. He never fully fits in, but he empathizes with whatever he passes. Like Baudelaire’s Flaneur, wandering the arcades of Fin-du-Siecle Paris, Kool-Aid Man keeps a cool and curious eye, strolling through the virtual world in search for the banal sublime. Kool-Aid Man’s motto is best summed up by a line at the beginning of Chris Marker’s Sans Soleil: “I’ve been round the world several times and now only banality still interests me. On this trip, I’ve tracked it with the relentlessness of a bounty hunter.'" Rafman's exhibition The Nine Eyes Of Google Street View opens today at the Saatchi Gallery, London and runs until August 29th 2012.